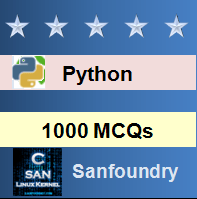 This set of Tough Python Interview Questions & Answers focuses on “Mapping Functions”. 1. What is the output of the following? 2. What is the output of the following? a) [‘a’, ‘b’, ‘c’, ‘d’]. c) [[‘a’, ‘b’], [‘c’, ‘d’]]. Explanation: Each element of x is converted into a list. 3. What is the output of the following? Explanation: TypeError, int has no len(). 4. What is the output of the following? Explanation: list(map()) returns a list of two items in this example. Explanation: Cannot perform join on a list of ints. Explanation: Each number is mapped into a string of length 2. Explanation: TypeError. Execute in shell to verify. Explanation: The floating point numbers are converted to strings and joined with a space between them. Explanation: map() is applied to the elements of the outer loop. To practice all tough interview questions on Python, here is complete set of 1000+ Multiple Choice Questions and Answers.